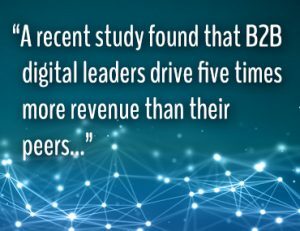 A recent McKinsey & Company study found that B2B digital leaders drive five times more revenue than their peers. And although companies have implemented digital workflows to improve efficiencies and reduce costs, they haven’t innovated around sales and the customer experience—and that’s where the real growth is. And, for many organizations, including Great Lakes Graphic Association members, that experience starts with their website. Any organization can make improvements to their digital strategy. But, knowing that perfection isn’t required, do Great Lakes Graphic Association members leverage online tools effectively? For example, do they utilize online channels to interact with customers and prospects, improve service and impact revenue? And, how do they rate vs. their peers in the industry and in other organizations? We decided to find out by analyzing each member website using a seven step process which you can review in depth below. In the most basic terms, your website is like the sign in front of your building. It directs customers to the entrance and welcomes them to learn more about you. And, just like a deteriorating sidewalk that connects to a dilapidated building with broken down equipment would give pause to any prospect, so does a poorly designed out of date website. And here’s another consideration. Although all websites should meet a number of minimum requirements, not all companies are created equal. Your unique business goals may dictate different online investments. For example, why use online channels to create additional demand if hiring additional staff to serve that demand is out of the question? Therefore, here’s the key takeaway from this analysis. You should honestly assess how your website fits with your business goals. Then, based on those goals, recognize your need areas and develop an improvement plan that elevates your position and revenue opportunities online. How Does Your Website Design Rate? An updated website design increases the possibility that a prospect will explore your capabilities. And nearly 50% of Great Lakes Graphic Association members have recently updated their site providing a compelling first impression. 30% employ an older design but incorporate effective navigation making it easy for their audience to explore their site. Unfortunately, 20% still use an old outdated design, one that creates an unnecessary and potentially inaccurate impression. If you’re not investing in an updated design, allocate the budget dollars to start that conversion. For prospects that don’t know your business, a USP quickly tells them what you do, how you are different and why it matters. In a world with hundreds of different printing and marketing options, a USP is especially important. Yet, only 15% of Great Lakes Graphic Association members have one. Fortunately, this is an easy fix. Take the time to develop a USP that effectively represents your company and services. Then, add it to your website. Some organizations spend thousands of dollars optimizing their website to elevate their page rank. And, it can be well worth the investment. However, hefty investments aren’t necessary to execute basic optimization correctly. Yet, only 19% optimize their sites effectively and 44% are below average. Basic site optimization means that a search for your company name results in multiple search listings for your company. If that search query doesn’t return obvious listings, it’s a virtual guarantee that a prospect will stop looking. But implementing basic site optimization delivers significant value. Want proof? Here are the before and after results for one company. Before site optimization the company had no first page search results listings. And, their average search position was 21. This equates to the bottom of page three, a page only 1.1% of users even visit. Six months later, improvements were significant. Now, when anyone searches for their company name or derivations of their brand, they show up loud and clear. And so should you. Portfolio and gallery pages, sample request forms and testimonials create a positive user experience engaging both customers and prospects. Yet, only 14% of the websites had a portfolio or gallery page that showcased their work. Just 16% contained customer testimonials and less than 5% had a specific sample request form. Nearly 100% of Great Lakes Graphic Association members provide paper or printed samples upon request. And although 100% of the web sites have a contact us form, why not integrate a simple, highly visible sample ordering process on your website that attracts prospects and generate additional business opportunities? Sample requests indicate interest. A prospect that requests samples is a qualified lead. And like any qualified lead, they often translate into sales. In fact, one company tracked prospect sample requests and found that 18% actually turned into a sale. But don’t stop with samples. A gallery or portfolio page show prospects successful projects that can spur interest. And, testimonials are another valuable information source that enhance the user experience. Plus, these resources, and testimonials in particular, influence the purchasing decision making process. Nearly 75% of prospects correlate testimonials with greater business trust. And when in the purchase consideration phase, higher trust often tips the scale on a sale. Studies suggest that a purchase decision is more than two thirds complete before a customer even calls a supplier. It’s one reason why website content is so essential. Today, prospects look online to self educate, build understanding and determine if you are a company they should work with. But, it’s not just your audience. Search engines value content as well. In fact, fresh content, such as new web pages, regular blog posts and resources like white papers and case studies can elevate your search ranking. But when it comes to content, only 8% of Great Lakes Graphic Association members appear to update their site content regularly. And 12% have clearly outdated content. Why not do this instead? A company started regular weekly blog posts. Each one covered information targeting the key industries they served. The posts were optimized with keywords that related to their brand and key service areas. Search engines indexed this content and served it to prospects and customers as they queried similar information. In six months, impressions (the amount of times their listing was viewed on a search page) increased by five times and click throughs to their website grew by 350%. Lead contact form submissions increased by a factor of seven - often turning into qualified leads. Today, only 12% of Great Lakes Graphic Association members publish a blog. A number of those don’t contain current information. Although it’s difficult to maintain a consistent content schedule, as you can see, it’s well worth the effort. With over 2,000 subscribers, a label printer distributes a monthly newsletter highlighting common customer pain points and the solutions the company provides. Email open rates average 30% with approximately 50 contacts clicking through to their website each time. And typically, around 10 of those contacts request more information often turning into a qualified lead. The fact is, newsletters are a great way to showcase new products, successes and remind customers of your broad product offering. However, only 18% of members promote a newsletter on their website. This is another effective communications vehicle you should implement. According to HubSpot, a white paper is a persuasive, authoritative, in-depth report on a specific topic that presents a problem and provides a solution. A company with digital printing assets developed an extensive white paper that detailed the technology, design implications, material considerations, best fit jobs and more. They promoted the white paper on their website and in their newsletter. In addition, they required an email address in exchange for downloading the document which gave them the ability to stay in touch. In three months, 60 people downloaded the white paper and 22 of those became qualified leads. White papers are ideal for prospects as they look to self educate and narrow down purchasing options. 16% of members provide white papers on their website. Lastly, case studies, with brief narratives and/or data showing specifically how you helped customers increase response rates, impact revenue or save money makes your products and services more valuable. Plus, like testimonials, they help increase trust and can tip the scale on purchasing decisions. 12% of member websites contain case studies. As detailed above, website content serves prospects through their spectrum of needs. It connects as they learn about the industry, your capabilities and as they narrow down their list of potential suppliers, when nearing a purchasing decision. And in addition to serving your target audience, effective content generates viable leads for your sales force. But, viable leads are nothing without a defined follow up program. Equally important, there are a few common elements that increase the probability that a lead will turn into a sale. What’s the quickest way to discourage your sales force to follow up on leads? Provide them with poor quality opportunities. Although an MQL is not a guaranteed sale, defining leads based on an agreed upon criteria will ensure that your team follows up on viable opportunities. Even in a B2B setting, studies show that fast follow up generates more discussions and sales. If your sales team doesn’t engage a prospect quickly, the opportunity for further conversations, let alone sales, drop significantly. 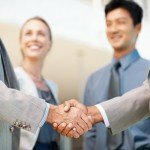 So, set the follow up time expectations and hold the sales team accountable. If sales determines the lead is Sales Qualified, then a defined follow up process is imperative. Although it seems intuitive that viable leads would get regular follow up, they often don’t get the attention they deserve. In fact, a HubSpot study found 44% of salespeople gave up after one try. Conversely, 80% of sales require five or more follow-ups. In addition, 63% of people requesting information on your company today will not purchase for at least three months – and 20% will take more than 12 months to buy. Unfortunately, we don’t have data on the amount of manual lead generation processes employed today. However, less than 1% of Great Lakes Graphic Association members use automated lead generation programs, such as marketing automation. Do you have a detailed process for following up on leads generated from your website? Great Lakes Graphic Association members website ratings are similar to other manufacturing sectors but rank below segments like technology, retail, financial services and healthcare. As cited above, there are dozens of attributes that contribute to an effective digital strategy. If your website needs improvement, chart the course and start making those enhancements. Websites aren’t a new phenomena. In fact, they are about to turn age 30. So recognize the impact they can have on your business and take the necessary steps to generate the leads and capture the revenue you deserve. Whether it's recommending digital strategy improvements or executing the right tactics for Great Lakes Graphic Association members or any printing company, InterEdge Marketing provides numerous services that elevate your position online including website marketing strategies, content marketing and lead generation programs that help organizations drive revenue. Subscribe to our newsletter to get bi-monthly tips on how to elevate your marketing programs.